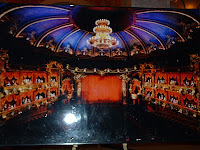 The Las Vegas Venetian has been home to a production of "Phantom of the Opera" for several years. . .so why did it take us until last week to finally go to one of the most spectacular musicals we've ever seen? Price. It's that simple. When prices -even at the discount shops -are above $100 for a 'good' seat, it lowers our enthusiasm proportionately. So an ad in a free, pocket-sized 24/7 Magazine (found in taxis and on displays in the Fashion Show Mall) was what finally got us to the musical, by way of the Web. 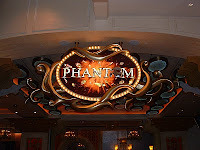 We logged on to http://www.phantomlasvegas.com/ and found at least three discount options available on certain performances while we were in town. We booked seats third row back from the front of the mezzanine, smack dab in the middle of the section (you do want to be high for this show) and got them for $69 plus taxes and fees. Without the discount the same seat was $135 on the web. When we picked up the tickets at will-call we asked if we really had saved money. The clerk reported that our seats would have been $145 each plus taxes and fees had we purchased at the counter. Once again, a little research saved a lot of money.